On the first day, you walk into class, surrounded by other bright-eyed, eager young students ready to learn the art and science of nursing. Textbooks weigh down your bag, and your pencils are sharp and ready. Most hospitals, just like most ambulance services, require that clinical staff wear an ID badge at all time. This identifies them by name and role (nurse, doctor, PA, etc. ), and often gives them access to secure areas as well. “Well,” we figure; “if they don’t know our name, they can’t complain.” So although the powers-that-be did insist that badges be worn, we started hanging them in odd places, like from our belt, or inside a pocket. Or covering them with stickers and other things. But the best of all answer of all was elegantly geometric, made especially easy by free-spinning retractable ID clips: simply twist the card so it faces your chest, and the only thing visible is whatever text happens to be printed on the back. Technically, you’re still wearing the thing, and if the boss notices you can just say “whoops, it got twisted,” but nobody can actually read your name, and, ninja-like, you can move through the ward unseen, a bescrubbed ghost. The nurses have turned this into an art-form, and in some places it’s like finding a four-leafed clover to see an RN with a visible ID (usually I figure they’re new there). But we’ve become awfully fond of this in EMS as well. People, I realize that the world’s a rough place, that patients can be impossible to please, and that even the best of us need to take steps to ensure we still have a job tomorrow. I do understand this. But there’s a certain point where you have to stop digging trenches, and realize that if you’re giving great care, following procedure, behaving professionally, and generally toeing the line, then you should be willing to stand behind your work. If you’re employed at the kind of place that’s willing to take any complaint as reason to show you the door, I assure you that no amount of ID-flipping will save you. Your days are numbered. Of course, even a good service will eventually start clearing their throat and looking at you pointedly if your personnel file begins to grow particularly fat, but at that point, maybe you really should consider managing your douche coefficient. Besides, this should all be moot, because when you meet your patient you’re introducing yourself by name anyway. Because that’s just common courtesy when you greet people. And patients are people. Right? Strive to do the kind of work that allows you the confidence to stand behind it. When someone points at you with forehead veins a-pulsing and demands to know your name so your supervisor can “hear about it,” tell them and tell them proudly. Sometimes, doing the right thing won’t be a defense against trouble — but you can be sure that playing “who, me?” will run out of rope even sooner than that. Clip your ID somewhere obvious — mine goes on my shoulder — where patients and staff alike can easily see it, and know what to call you and what role you’ll be playing in this show. When I see somebody with a visible ID, I take this as a good sign about their responsibility and willingness to own their work. And those are qualities we need in EMS. Russ Reina runs one of my “sister blogs” on the EMS Blogs network, EMS Outside Agitator. 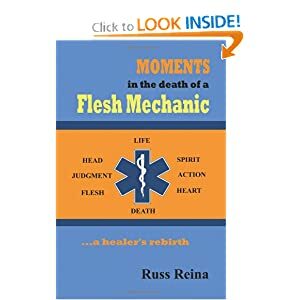 Although no longer working in EMS, he spent over a decade as a medic, way back in ’70s when the paramedic concept was first being introduced in the US; he later became involved with various other things including writing a film, working with Native American healing arts, and a book — Moments in the Death of a Flesh Mechanic: a Healer’s Rebirth. More recently he’s become active in the online EMS community via his blog, forums (he’s a moderator over at EMTLife.com), and similar venues. Some time ago, Russ sent me a free copy of his book in exchange for my honest review. I read it, and enjoyed it, but it’s been sitting on my shelf since, because I haven’t been sure what to say about it. To start with, let’s mention the elephant in the room. The stuff Russ talks about makes people uncomfortable. To be sure, he’s walked the walk, spending more hours on the road than many of us, and doing it in a time and place where that meant wielding tremendous responsibility in patient care. It’s hard to argue that he was a skilled and competent medic in his day, the kind of guy you’d be glad to have on scene or sitting beside you in the cab. But since then, he’s gone down a different road, and done a lot of… other stuff. I confess that I share some of this attitude. I’m a simple, concrete guy at heart. But I also think that the things Russ talks about, and forces us to think about, are important — and that the reason we’re uncomfortable with them is the reason that we need to have that conversation. The basic aim of his book is to weave together the calls he ran, the patients he sat beside, the lives and the deaths he saw, and look for the common threads. Not in the patients, but in him. As a paramedic, what was his role? When you take a step back from this job, when you stop for a moment and consider what it’s all about, what’s really going on? If we’re diligent, and competent providers, we spend a great deal of time trying to improve the quality of our work: our knowledge base, our hands-on skills, our understanding of medicine and the human body — the how. But very little attention is ever given to the why. Why do we do this? It’s easy to be cynical — “well, the schedules are good, you get to cut people’s clothes off, and I was too dumb for anything else.” We’re professional cynics, and the job tends to beat the mushy stuff out of us. But although we rarely admit it, most of us did choose this job for real, human reasons. Something about helping people. So we show up at the door wanting to help people. Then, usually a couple years later, most of us leave EMS to become nurses or electricians or vacuum cleaner repairmen. What happened between point A and point B? You can call it burn-out, you can call it low morale. You can blame low pay and a “revolving door” culture and a million other things, most of which are valid and true. But the fact remains that even though people are coming to EMS with the right intentions, most of them aren’t surviving here for long, and of the ones who do stick around, many are empty shells, long since stripped of any human connection they once sought. This is an ill system. It’s not dying, we’re not end-stage, but we are not healthy or happy: the methods, mindsets, attitudes, and overall “immune system” necessary to keep us all going, to maintain our ideal homeostasis, is missing. Individually and collectively, as time passes we move down rather than up. Some rare individuals do find solid grounding and manage to put in 20 years as fully-functional people as well as caregivers, but they are the exception, and they do it by developing these tools on their own. It’s not about competence. Many of our “walking wounded” are competent clinicians, adequate or even excellent technicians. Russ calls them flesh mechanics. We master the skills of of patching holes, adjusting rhythms, replacing fluids, and generally repairing the broken parts of the human body, all without ever acknowledging the people inside those bodies. To some extent, of course, this is an essential part of the job — it’s the M in EMS, it’s why we’re called to the scene. We ought to try and be excellent mechanics so we can save the most lives and mend the most harm. But this whole process is entirely separate and distinct from the motivations that brought us to the job to begin with. There’s a fundamental difference between tending to a car and tending to a person, and when we successfully manage to eradicate the human element, we quickly find ourselves unsatisfied and burned-out with our work. (It’s not like we’re getting rich doing it, or otherwise being externally rewarded.) Russ’s own journey of transitioning from a pure flesh mechanic back into someone who worked with people is the focus of his book. Why do we do it? There are dozens of reasons you might pick. Some folks like to work and play at the boundaries, the liminal spaces between life and death. Some just really like meeting the people. Some, like Russ, have a more spiritual approach. Some find meaning from the teachings of traditional religion. As for myself, I hate death, and suffering, and I want to guard people from it. And I think that I probably get an ego boost from fighting for the weak, and certainly from uncovering an interesting diagnosis. But most of all — and it’s the mindset I advocate for on this site — I simply adopt a deontological outlook: I believe that when we take a patient into our care, we assume a duty to do everything possible on their behalf. Not the duty to weigh the pros and cons, not to judge their need or worthiness, but simply to do it. Everyone deserves at least that. But you might disagree. And that’s the key: many of us will disagree on how to handle the “why.” Unquestionably, I disagree with many of Russ’s views, or simply find them alien. However, I still think that it’s absolutely essential that we each find some meaning. There must be some human purpose to our work or we will not be happy, and eventually, we will not do it anymore. That’s the secret that Russ was able to uncover after enough years on the job and enough years away from it. Dozens of answers to the question are acceptable, but we at least have to ask the question; we do have to think about these things and not brush them aside. We have to operate on this level or we will not survive in the long run. Spirituality may or may not underly EMS as you understand it. But people — not just patients, not just broken machines — are unavoidably central to practicing medicine. You can do the job without that human connection, without the “why,” but it’s like showering with your raincoat on. You can’t feel it, and you won’t do a good job, and eventually you’ll give up and stop trying. So to make a long story short, I think the task Russ has undertaken as an “agitator” is a tough one, and he won’t win many fans. Although he often clashes with the Rogue Medic, their jobs are not dissimilar; one is an continual gadfly working to force us toward better evidence-based medicine, and the other is a continual gadfly working to force us toward a healthier understanding of our job. I wouldn’t want to be either one. But I’m glad they’re here, because I also don’t want to watch good people being wasted in the cauldron of cynicism and pointlessness that is much of EMS today. In any case, I do recommend his book. It’s an enjoyable read, well-written, with plenty of the entertaining stories that all veteran medics collect and that make the best EMS blogs and literature such good reads. It’s also a rare view of the early, Johnny-and-Roy days of paramedicine, and it’s fascinating to see what’s changed over the years and what hasn’t. But mostly, I think it’s worth reading because Russ’s crusade really does have a vital purpose. If I have a quibble, other than the fact that his unorthodox background may turn many readers away from his message (although fairly little of that is present in the book), it’s that despite raising awareness to the problem, Russ is relatively silent as its to solutions. Of course, this may be the nature of the beast, where each of us needs to find his own answers. But on the large scale, I doubt the endemic disease of EMS will be cured in this way. We can try, though. Let’s try.